Choose the best water cooler for your needs. Choosing the right water cooler for you. Stainless steel reservoirs give any water a better taste and are more sanitary than recycled plastic. All components that come into contact with drinking water must be sterilized. The cooler should have removable taps as this is the most important area to sterilize. If the water cooler will be placed in an area with direct or indirect sunlight, it is best to choose a model with a solid cover. If you already have a water cooler and it is in a bright area, purchase a bottle cover. Bright light and heat will promote the growth of bacteria within the cooler. Our most popular model featuring superior hygiene and hassle-free maintenance. 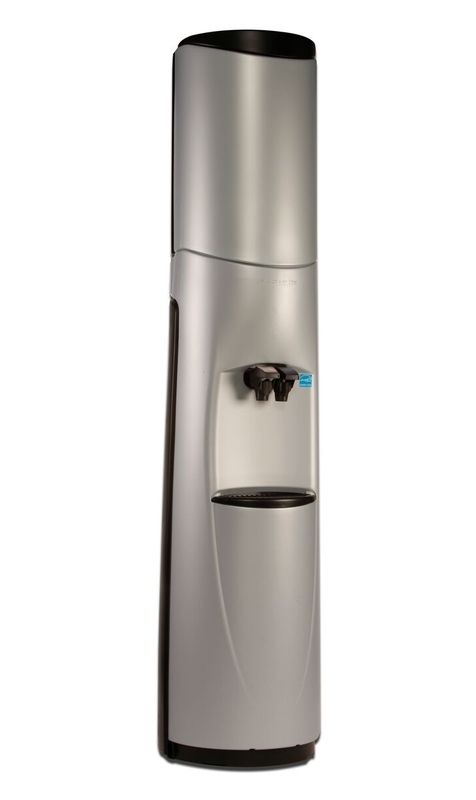 A modular and unique modern-look water cooler designed for flexibility, superior hygiene and easy maintenance. The Pacifik comes with a cover to protect your water from UV light. Available in charcoal or pewter. Recommended for areas that are not brightly lit or affected by UV light. Because Jackson Springs water is "live" it cannot be placed near heat or light. This entry level water cooler has high-flow faucets, adjustable thermostat, and a 2.5L stainless reservoir for cold water on demand. This model blends smoothly into any decor. This model will never overpower a room but will serve as a quiet reminder to drink your water throughout the day. The exterior is scratch resistant, with a chrome coloured trim, and comes with a cover to protect your water from UV light. The S2 features a handsome design, aesthetically superior to most water coolers, is sure to please! The classic stainless steel design will fit very well into most environments, whether it is a modern kitchen, a comfortable living room or an executive office. A sleek and modern countertop water cooler that offers modularity, flexibility and a very sturdy design. Dispense Water from your refrigerator. The FLOJET Bottled Water Dispensing System is designed to pump water from a 5-gallon water bottle. The system will deliver the water under pressure to the water inlet of a refrigerator for chilled drinking water. When the suction wand is inserted into the standard 5-gallon bottle, it will activate the float switch on the end of the wand and turn on the pump. This same float switch shuts off the system when the bottle is empty. The wand has a built in back-flow valve that prevents water in the system from flowing back into the bottle, or spilling while changing bottles. Fits 18.9 L (5 gal) bottles. Dispenses as quickly or slowly as you would like. Cleaning brush provided, no batteries needed. Use for home, office, school, factory, or hospital. The fabric bottle cover is used to protect your water from UV rays, which may cause algae to form in your jug if left for long periods of time. Elasticized, easily slips over the jug and launders easily. Ten ($10) deposit required on all jugs. Ten ($10 ) deposit required on all jugs. The Bottle Buddy is a modular storage system which conveniently holds up to 4 jugs of water. This crown and cradle set allows easy access to our natural spring water anywhere you go. The cradle sits on a counter top or table and holds the bottle, inverted at a 45 degree angle, while the valve dispenses the desired amount of water. It’s perfect for home, office, sporting events, camping and more.